One of the wonderful discoveries I made while in the United Kingdom recently was the great archaeology that had been done over a fifteen year period by the Time Team. They had managed to host television shows featuring very aggressive digs over three-day periods at various sites around England, and elsewhere and putting them on television in an entertaining way. Working fast as they did, the Time Team has managed to do an enormous amount of research that has culminated in tremendous work in England in understanding their pre-history cultures, the Vikings, Anglo Saxons, Romans, Normand’s, and the relatively recent Victorian Age settlements to better assemble a history of England that nobody really understood prior. Personally the most explosive example of the Time Team’s value to the United Kingdom was the work they did in Canterbury as seen below. My son-in-law is from that region so it had been a goal of ours to visit his homeland and get to know the elements of that place which helped shape him into the fine young man that he is now. When I first met him I was happy to learn that he was from Canterbury because Canterbury Tales was one of my favorite classic pieces of literature. Along with James Joyce’s Finnegan’s Wake, Canterbury Tales was one of those really hard books I pushed myself to read while living on campus at the University of Cincinnati in what I would call my days of breaking free of society’s intellectual shackles. Nobody was doing things like that when I was 25 freely reading those great works of literature while eating my breakfast, lunch and dinner almost every day in the Perkins at Coryville just to the east of the main campus of the University of Cincinnati. Now people did read them because their literature professors gave them homework assignments to do so, but nobody did it for fun, like I did. Even though I had a car in those days, most of my time was spent walking between the apartment I was staying at and that Perkins reading my books, such as Canterbury Tales. So it was quite odd for me that my daughter had out of all places in the world meet a young man from Canterbury and was intent to marry him. Fast forward 25 years into the future from the time that I was readying Canterbury Tales at that Perkin’s restaurant in a college campus environment to doing nearly the same thing in Canterbury itself this time not just reading classic literature in a studious setting, but seeing the places where Thomas Beckett was actually slaughtered and visiting the pubs and inns that were put on the map because of the pilgrimages to Canterbury Cathedral to visit the tomb of the slain archbishop who had fallen out of political favor with Henry II. 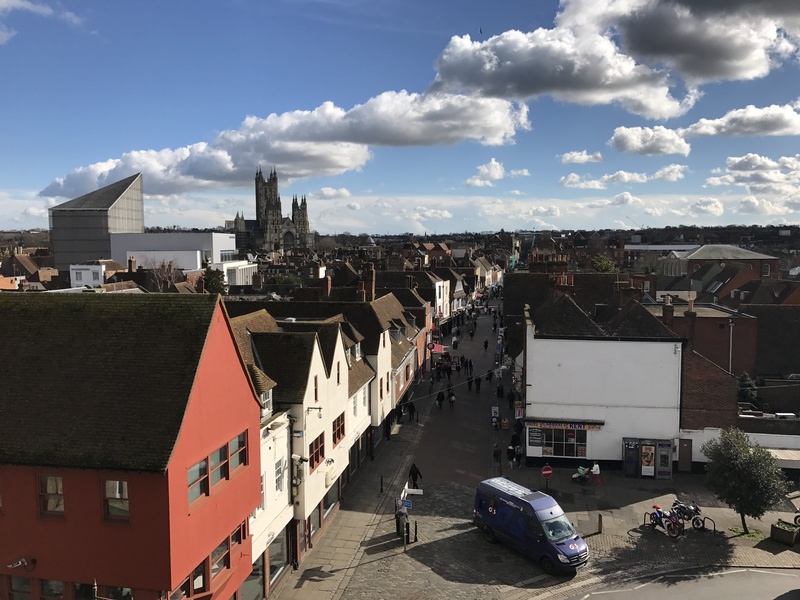 Because the intent of the visit to Canterbury was to visit my son-in-law’s family and see how he grew up, we were staying in a flat in the 4th most expensive city in all of England just one street over from the Canterbury West train station. It was the closest thing I had come in over two decades to living the “college kid” lifestyle that I had when I first read Canterbury Tales—and it was strange. We actually lived in Canterbury as opposed to staying at a hotel. At our flat we lived like we would at home doing laundry, preparing meals, and conducting life in general outside the mode of being on vacation. There is quite a difference. Over the course of February my wife and I discovered our favorite shopping spots for getting food and we developed a nice relationship with the pizza place directly across from the Westgate Towers—because we ate a lot of pizza. Canterbury became a second home for us. However, for the part of me who would have loved to have been an archaeologist if I could put my other interests and career paths in some other order—Canterbury was like living in a dig site. With their long history of prehistoric people who were conquered by the Romans, the Anglo Saxons, then the Normans—before being dominated by Catholicism, the history of this particular city was extraordinary and something that I soaked up like a sponge. Not to mention that it was just a short walk from our flat where the pilgrims began their journey to America—so there was plenty of history to investigate and that’s what my wife and I spent most of our time doing around Canterbury. After reading so much about the place for such a long period of time I was finally able to put my eyes on the real things and touch history as it was—which for me was very satisfying. Canterbury is a microcosm of what I think has happened to the rest of the world. In the macrocosm of modern history wars have defined our understanding of things and caused a very shallow recollection of our roots toward civilization. But the world is just too big and our sciences are too slow to truly get to the roots of things. For instance, the Time Team tried to do a similar show in America on PBS but they just couldn’t get it off the ground. America is a different audience and things are spread out differently. And in regard to our mound culture in the States everything is protected by the Native American Graves Protection and Repatriation Act (NAGPRA). So archaeology has become nearly impossible in America for that very reason making it so that there isn’t any quick study over three days of the most ancient mysteries so obvious to American audiences, like Cahokia, the Newark Mound complex and Serpent Mound. But the Time Team wasn’t so constrained in the United Kingdom and what they were able to unlock in a relatively short period of time was short of extraordinary. That left a lot to explore for a guy like me in Canterbury and I relished it immensely. There were in Canterbury several mounds that I could see on an ancient map of the city dating back to the Romans, burial mounds all over the place just the same as were found in Stonehenge and in the United States at Fort Ancient and they all date back to the same periods. I saw physical evidence of two large ones, one at the St. Augustine’s Abby and another right next to the old Roman walls that was as tall as the Miamisburg Mound. Archaeologists in the area attributed that mound to the Romans who moved into the area, but because of my history with the mounds of Ohio, I would associate it as being before the Romans and for the same reasons. I think the Romans put their imprint on the mounds they found in Canterbury, but I don’t think they initiated them. But what was astonishing was that they were there—part of the history of Canterbury and its many microcosm layers of history were there for all to see focused on that one point in the world. There are very few places anywhere that so much history could be observed in such a preserved way in a relatively confined space. What made Canterbury unique was that it was the target for many civilizations to make their mark as opposed to building cities here and there within twenty miles of each other. At Canterbury each big revolutionary period of human consciousness along the present Vico cycle was layered on top of each other for future archaeologists such as the Time Team to reveal to the world in a glorious television production which contributed immensely to our understanding of these periods. The Time Team would go on to write several very important books on archaeology namely Fancis Pryor’s Britain BC and Tim Taylor’s Guide to the Archaeological Sites of Britain and Ireland. I picked up Tim’s book at the St. Augustine’s Abby site and I found Pryor’s book at Stonehenge which both made my entire trip worth it alone. These are books that you can find online, but not as easy as you might think in the States because the two cultures just don’t work well together intellectually. What Pryor has been doing is similar to the very independent work of Fritz Zimmerman in America but schools of thought haven’t yet put two and two together. But that’s part of the fun of discovery. Zimmerman is dealing with a political culture in the States that is using laws the way the Catholic Church imposed its will on private citizens to control thought and history in Canterbury for at least five centuries strongly and another five modestly—but now the Time Team finds itself in a unique place where the politics in England is conducive to archaeology because of the various progressive elements that are trying to rot away the foundations of the Church to overthrow their current society. So for the members of the Time Team, they went to work in a short period of time and are continuing to do fantastic work which has expanded the historic knowledge of Canterbury and the surrounding English countryside. One thing I did notice at Stonehenge was that there were many archaeologists working on the site presently as they had their cars, campers and tents set up away from the tourist areas. In America it is rare to see this kind of aggressive investigation simply because universities have not made it a priority and the politics of the times have not been friendly toward investigation. We really need to fix that in America because we could use our own version of the Time Team. But after visiting Canterbury and seeing many things up close that I have long been curious about, I am more convinced than ever that the cultures of prehistory Canterbury and southern, central and western England were actively working with cultures in North America through sea trade that was much more advanced than anyone has previously committed true scientific thought to as of yet. I am grateful for the chance to have gone to Canterbury having all the great work that the Time Team and many others have contributed so that my time as a born again college kid living on the campus of that ancient city could wander around the streets with my notebooks, books, and camera validating in the microcosm something that interests me greatly on the macro. The evidence was there for everyone to see and it was fixated on that spot because for the western world, it was the cradle of civilization. Literature by Geoffrey Chaucer first drew my eye to Canterbury and my daughter’s marriage to one of its sons was the second, but before these events Canterbury was already ancient and laced with a deep history that was covered by time and only unearthed by human ambition through war and profit. And that made eating pizza across from the Westgate Towers much more meaningful and mysterious as the echoes of the past came to me uniquely through the circumstances of authentic living for just a short time in an ancient place dying to tell its story on a global scale through whispers in the wind and ghosts from its catacombs.